Premium quality training: Same content as live training without the travel expenses. Efficient and cost effective: Login from anywhere with an internet connection. Credibility: Training is taught by the leading expert practitioners in the industry. Career Advancement: Finish your Certificate of Training over the Web! Contact us: elearning[at]bpminstitute.org for more information. Alternate ways to online enrollment: Call (508) 475-0475 x15 to enroll in any eLearning course. What is the duration of an On-Demand course? Each On-Demand course contains the equivalent number of hours as a typical full day training course - approximately six hours. On-Demand Training is one of BPMInstitute.org's wide range of convenient training delivery options. Students attend a virtual classroom, without leaving the comfort of their own office. Using high impact web conferencing technology designed for maximum interaction, students can access the virtual classroom remotely, from any location worldwide. Why is BPMInstitute.org offering On-Demand Training? 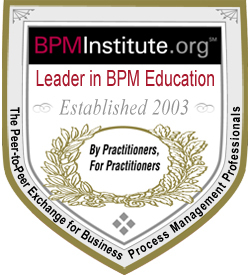 BPMInstitute.org is responding to the need to offer BPM training to geographically diverse individuals and organizations around the world who may be unable to travel to an in-person training event. On-Demand training provides the student with the opportunity to take training courses from the comfort of their desktop. This training option benefits the students by eliminating travel costs as well as time away from the office. What courses are available as On-Demand Training? We currently offer most of our core courses via On-Demand training. How can I enroll in a On-Demand training course? You are able to enroll in a course via the "add to cart" link found on the course's description page. As an alternate to enrolling via the Web, you could call (508) 475-0475 x15 between 9am and 5pm EST to enroll. How many students can access a On Demand course? All courses are sold on a per head basis. Example: A team of 3 would need to purchase a copy of the course for each individual. Do On-Demand courses count towards a Certificate of Training? Courses taught via On-Demand along with each of our other delivery methods all can be put towards a Certificate of Training. 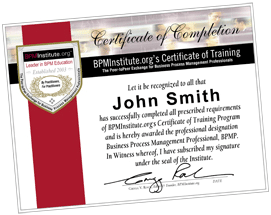 Read more about the BPMInstitute.org Certificate of Training program. Pre-purchase your Certificate of Training and save. Can I earn Professional Development Units for On-Demand Training? Project Management Institute Professional Development Units are available on request for each On-Demand training course. Students can earn one PDU for each hour of online training, totaling eight after completing the two four-hour course sessions. Course logistics - this section covers delivery and methodology. How is On-Demand Training delivered? Upon registration, attendees will receive login details and acccess to course materials. Attendees can access course materials using an internet connection and their web browser. When do the On-Demand courses start and end? On-Demand courses can be accessed 24/7/365. Once you have registered for a course, you can access them for up to one year. Windows 7, Vista, XP or 2000. Microsoft Internet Explorer, version 7 or later with ActiveX allowed. Latest version of Flash prior to accessing this course. Download Flash from Adobe.com. You will need a computer always connected to the internet with unobstructed internet access through port 80 and 443 (http and https). This is standard in most companies. You will not need to install extra software on your own PC. View complete system requirements documentation. What is the cost of On-Demand Training? This depends on your BPMInstitute.org membership status. Professional members save 15% on all eLearning courses, simply login to get your code when you register. Corporate members use the CM code when registering to save between 15% and 25%. What will the students get to keep after On-Demand Training? All attendees will be able to keep the course materials and the exercise project files produced during training. Do On-Demand courses cover the same content as classroom training? On-Demand courses cover the same content as for its corresponding classroom course version. Instructors utilize the same presentations, demonstrations and exercises as classroom training sessions. Payment is due in full at the time of registration. If you have any questions, please call the eLearning Manager at 508-475-0475 ext. 15. Alternatively to online submission, you may print the registration forms and fax to 508-475-0466 or mail to BrainStorm Group, Inc. 45 Lyman Street, Suite 23, Westborough, MA 01581. You may also register via phone by calling 508-475-0475 ext. 15.